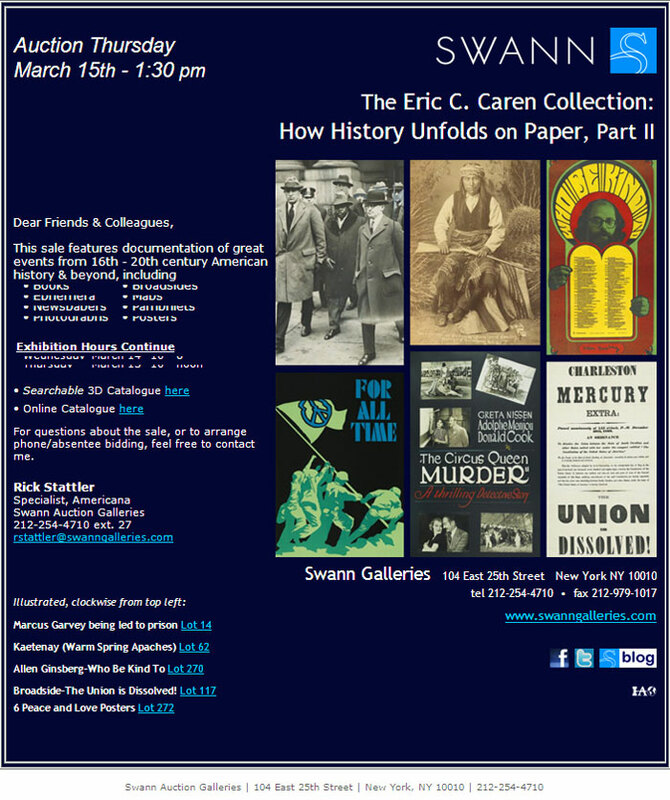 This is the second sale of material from Eric Caren’s collection, which aims to document every important event in modern history through books, manuscripts, autographs, photographs, posters and ephemera that span the 16th century through the 1970s. American Indian portraits by some significant photographers, including Edward S. Curtis, Frank Rinehart and David Barry, who shot the image shown top left, a boudoir card portrait of Good Horse and his wife, 1900s-10s. Theodor de Bry’s Admiranda Narratio Fida Tamen, the first Latin edition of the first volume of De Bry’s Great Voyages, Frankfurt, 1590. A large selection of 1960’s and 70’s anti-war and rock and roll posters. Presidents of the United States, a chromolithograph by Augustus Feusier, 1861, shown left, and other material relating to Presidents, including an early photographic portrait of Lincoln before he was President. Broadsides, including the first printing of the first act of secession, printed fifteen minutes after the final vote, Charleston Mercury Extra, 20 December 1860. Born in Dortmund, Germany, Werner Muensterberger (1913-2011) started collecting African art as a teenager, inspired to do so by his godfather, the renowned collector Baron Eduard von der Heydt. Muensterberger held three PhDs, in psychiatry, anthropology, and art history, and specialized in psychoanalytic anthropology. He was the author of several important early publications on African, Oceanic, and Native American art, including The Sculpture of Primitive Man (1955) and Universality of Tribal Art (1979); as well as Collecting: An Unruly Passion (1995), examining the psychology of the collector. The auction features a small group of masterpieces acquired during a lifetime of collecting. 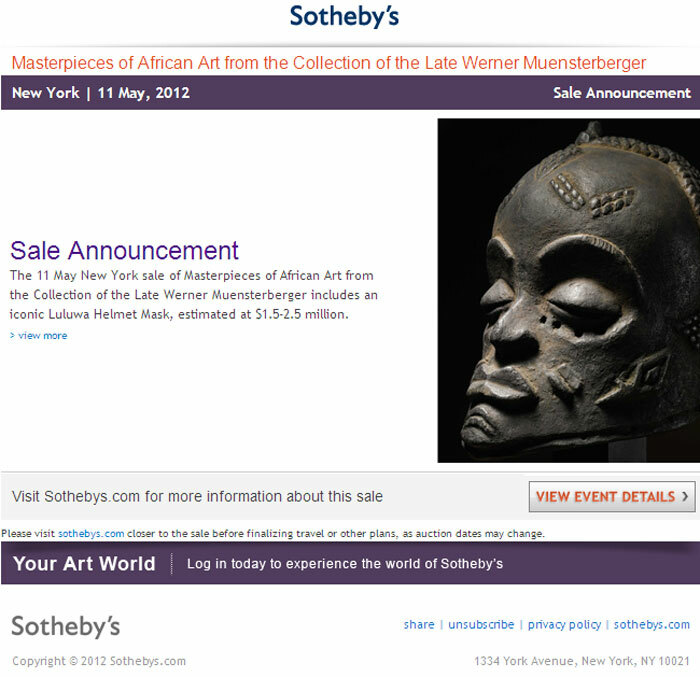 The sale is led by Muensterberger’s iconic Luluwa Helmet Mask, famous for its superb quality and monumental scale (estimate $1.5-2.5 million). This spring, Sotheby’s is delighted to offer a joint single-owner sale of fine English and European decorative arts from the estate of Roger Rechler and the Collection of Dorothy and Wendell Cherry. Each of these collectors had a distinctive style favoring English, French and Continental furniture and decorative arts which transformed two rather different interiors, namely a fine formal townhouse in New York City’s Upper East Side and a beautiful turn-of-the-century Southern Colonial villa situated in idyllic Kentucky horse country. Whilst building such distinctive collections, both collectors shared a passion for breeding and showing dogs, many of which lovingly shared their lives and their homes. 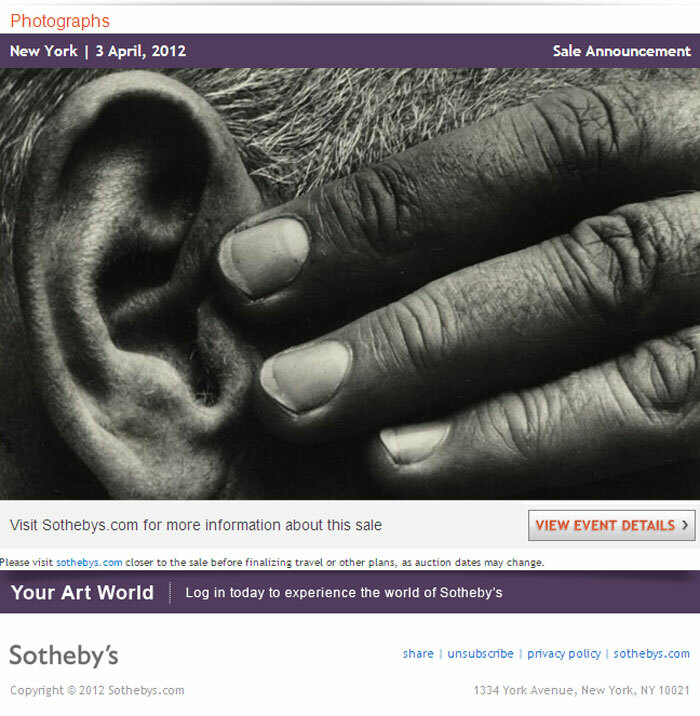 Sotheby’s was the first international auction house to offer regular sales of Photographs, beginning in 1971 in London, 1975 in New York, and 2002 in Paris. We sell photographs from the entire history of the medium, from salt prints and daguerreotypes of the 1840s to contemporary works of the present decade. Included in our auctions are works by a roster of blue-chip photographers from around the globe, from William Henry Fox Talbot in London, to Eugene Atget in Paris, to Richard Prince in New York. Our international team, the most experienced and highly regarded specialists in the auction world, has established itself as a leader in scholarship and evaluation. Their passion and expertise have resulted in dozens of world records for individual photographers, brought new categories of work to the public’s eye, and defined many of the market criteria against which photographs and collections are judged. 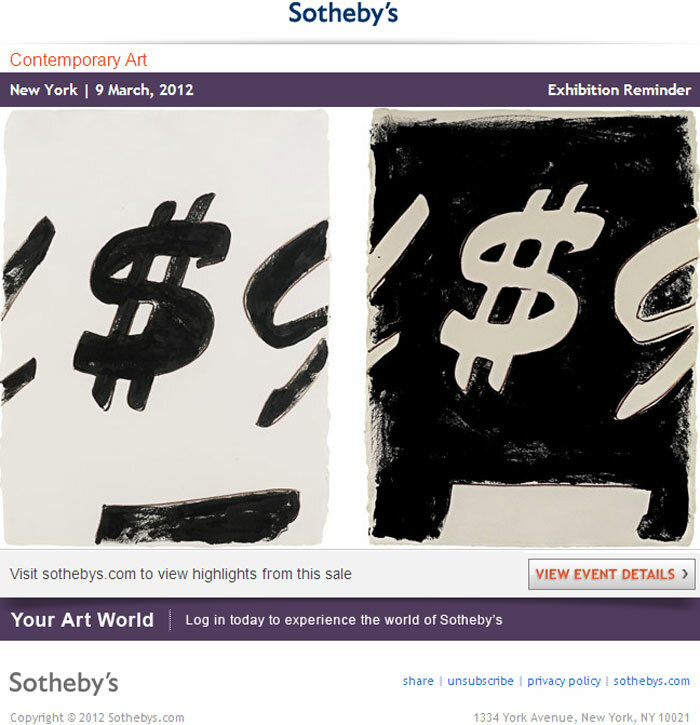 The bi-annual Contemporary sale is one of Sotheby’s must-see sales of the spring season. The March 9th event celebrates the work of established post-war masters such as Warhol, Rauschenberg and Calder alongside works by today’s most intriguing creators such as Yuskavage, Tomaselli and Condo. This highly curated sale features iconic and jewel like paintings, drawings, sculpture and photography dating from the 1930s through today. A few highlights this season include the iconic image Untitled Film Still #21 by Cindy Sherman. Additionally, the sale includes beautiful works by Gerhard Richter, one of the most desirable and celebrated artists of today. Finally, there are iconic and classical paintings and works on paper by Abstract Expressionists including Hans Hofmann, Adolph Gottlieb, Robert Motherwell and Willem de Kooning among others. Our Finest and Rarest Wines auction on 21 March in London features three great collections that together epitomise the appeal of buying wine at Sotheby’s. The Bordeaux Wine Bank Collection kicks off the sale with parcels of First Growths, Classed Growths, Second Wines and Right Bank Bordeaux from 2000-2007. The Adrian Bowden Collection Part III gives wine lovers the opportunity to acquire rare and highly sought-after bottles from Bordeaux, Burgundy, The Rhône and Australia from this magnificent cellar. A stunning ensemble of Bordeaux, Burgundy, Champagne and German Wine comes from the aptly named Classic Collector’s Cellar whilst the remainder of the sale includes Burgundy from Domaine de la Romanée Conti and Henri Jayer, Rhône from Guigal and J. L. Chave and further parcels and mixed cases of Bordeaux from the last four decades. ‘Portrait of Anna Maria Borghese’ (née de Ferrari, 1874-1924), painted by Vittorio Matteo Corcos (Italian, 1859-1933), oil on canvas, 71 x 43¾-inches, est. $15,000-$25,000. Sterling Associates image. CLOSTER, N.J. – Following the overwhelming success of its inaugural Estates Auction in December, Sterling Associates is preparing a March 31 follow-up event that features an exciting array of antiques and art from some of New Jersey’s finest homes. The 350-lot sale includes a superb selection of paintings, sculpture, 18th- and 19th-century furniture, and autographed historical ephemera. A special offering of Chinese ivories and Asian porcelain has been added in response to the strong demand shown for this category in Sterling’s debut. The fine art section is led by the wonderful Portrait of Anna Maria Borghese (née de Ferrari, 1874-1924), painted by Vittorio Matteo Corcos (Italian, 1859-1933). 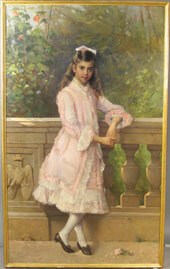 The framed 71 x 43¾-inch oil-on-canvas portrait depicts the young Italian noble in a pastel pink dress, her arm resting upon a terrace railing. Exhibiting outstanding technique in both its delicate flesh tones and shadings of background foliage, the appealing artwork is entered in the sale with a $15,000-$25,000 estimate. 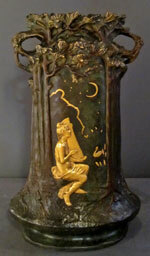 Art Nouveau gilt bronze vase with foundry mark “E. Blot Paris Vrai Bronze,” signed ‘Jouant,’ 25½-inches tall, est. $4,000-$6,000. Sterling Associates image. One of the highlights of the decorative arts section is a 25½-inch patinated gilt bronze Art Nouveau vase with the foundry mark “E. Blot Paris Vrai Bronze.” The artist, Jules Jouant (French, 1882-1921), skillfully created a relief image of a seminude young woman playing a lyre beneath a crescent moon and stars, with a swan swimming in nearby willows as its background. The dual-handled vessel is profusely carved with telescoping tree branches that terminate in flowering branches. The vase’s presale estimate is $4,000-$6,000. A pair of figural gilt bronze compotes came from a home whose owners appreciate the elegance and perfection of 19th-century French design. Scrolling cabriole embellishments and a bird and acanthus leaf motif garnish the pedestals, each of which supports a shell-shape bowl. The pair will be offered with a $6,000-$8,000 estimate. Another elegant duo is the pair of circa-1840 French chenets of gilt bronze mercury. Created for use as fireplace adornments, the 16-inch-tall chenets depict a three-dimensional cherub and fairy, respectively, each figure seated on a pedestal and holding a lengthy garland of flowers. Together, they are estimated at $4,000-$6,000. Pair of circa-1840 French chenets of gilt bronze mercury, 16 inches tall, est. for pair $4,000-$6,000. Sterling Associates image. Sterling Associates’ owner, Stephen D’Atri, is especially pleased to have amassed an exceptional grouping of Asian antiques to offer to bidders in his upcoming sale. He said he is giving bidders what they want, based on the results of his first auction. “The star of our December sale was an 18th-century Qianlong cloisonné censer with kirin lid, which we had estimated at $6,000-$8,000. It attracted multiple Asian bidders over the phone and Internet, and ended up selling for $28,750 (inclusive of 15% buyer’s premium). 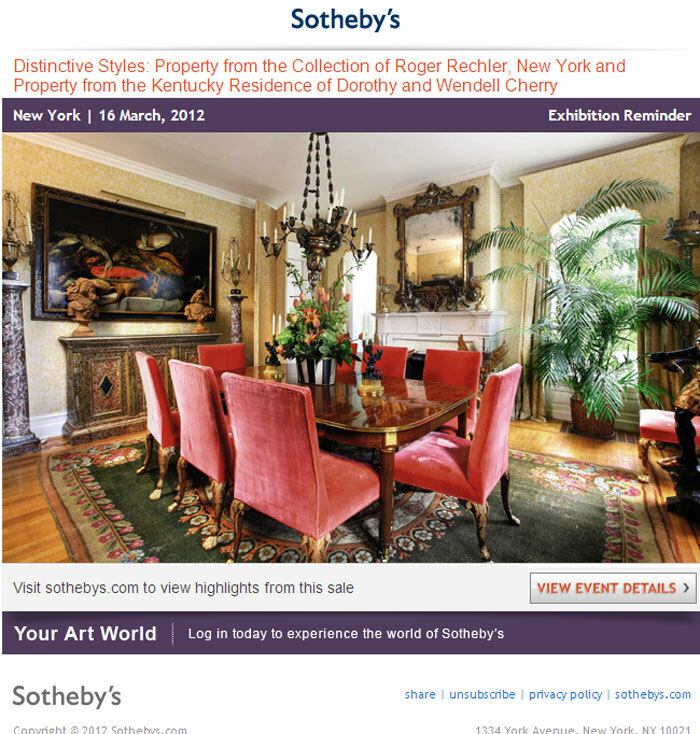 That sent a clear signal that the demand for top-quality Asian antiques is not relenting,” said D’Atri. A selection of 19th- to early 20th-century Chinese, Japanese and Indian ivory figures from three different estates. Sterling Associates image. The March 31 auction includes a sizable grouping of Chinese, Japanese and Indian ivory figures coming from three different estates. All are of old ivory, and date to the 19th or early 20th century. A few of the figures are of Shiva goddesses, and one particular highlight depicts Quan Yen with a baby, riding atop a wave with a dragon emerging. The group of four Immortals exhibits very fine tooling and could possible be Japanese. An interesting lineup of antique and vintage ephemera has been cataloged, as well. A portrait of George Washington, framed together with a 1795 document signed by the first U.S. president, is estimated at $12,000-$16,000. The document confirms the appointment of “Richard Dickinson of Connecticut” to the position of “Inspector of the Revenue for the Port of Saybrook.” The historical 18th-century document signed in Philadelphia was acquired from the home of a distant Dickinson relative who is now deceased. 1946 letter written by Edward M. “Ted” Kennedy, then a prep school student, to “Miss Ethel Skakel, Manhattanville College.” Skakel ended up marrying one of Kennedy’s elder brothers, Robert. Estimate: $400-$600. Sterling Associates image. A holographic letter written by Edward M. “Ted” Kennedy in 1946, long before his days in politics, is addressed to “Miss Ethel Skakel, Manhattanville College.” [Skakel ended up marrying one of Kennedy’s elder brothers, Robert.] 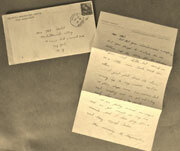 The chatty letter, written in longhand on Cranwell Preparatory School stationery, speaks of upcoming exams, having to do “manual labor” for getting caught “fooling around one night,” and also reminds Ethel that she “forgot to include six dollars and the stubs for the chances” in her last letter. The lot is estimated at $400-$600. Antique doll collectors won’t want to miss the grouping of 16 antique and vintage dolls to be auctioned. Many types are represented, including German bisque-head, composition and cloth dolls. Manufacturers include Simon & Halbig, DEP, Heubach Koppelsdorf, and J.D. Kestner. Estate collection of antique and vintage dolls, mostly of German manufacture; bisque, composition and cloth examples. Sterling Associates image. 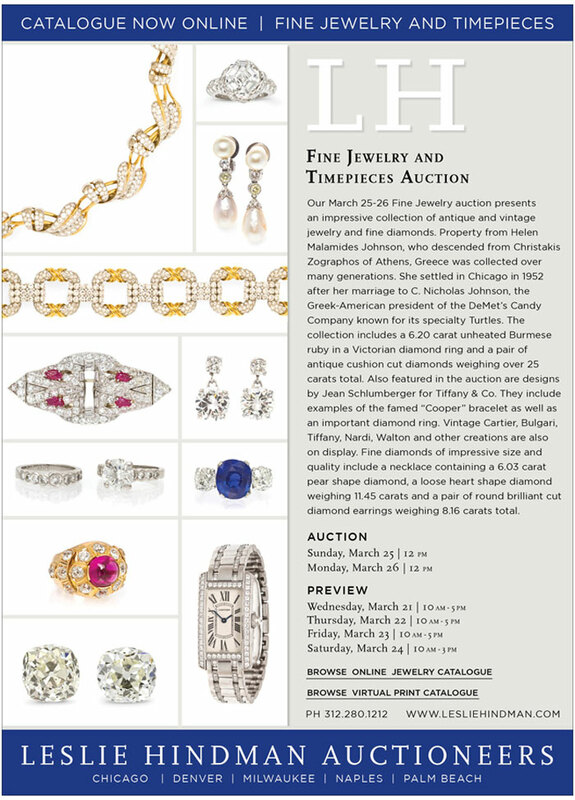 Stephen D’Atri will be exhibiting highlights from the March 31 auction at Stella’s Pier Antiques Show in Manhattan on March 17-18. He invites all interested parties to view a handpicked auction selection and visit with Sterling Associates staff members at booth #4300. Sterling Associates’ Spring Fine & Decorative Arts and Furniture Auction will be held on Saturday, March 31, starting at 12 noon Eastern time. 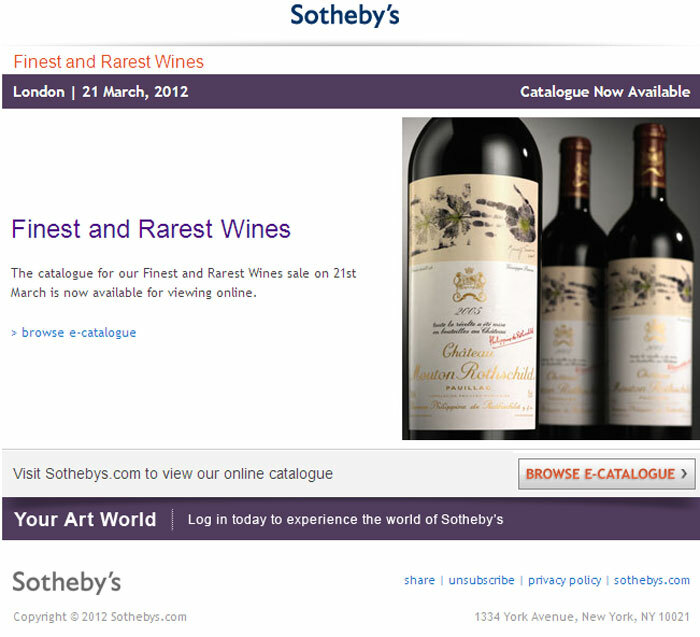 It is structured as a hybrid auction in which previewing is available at the physical gallery, but all bidding is exclusively absentee, by phone or live via the Internet through LiveAuctioneers.com. The live gallery preview is from 10 a.m. to 5 p.m., March 27-30 inclusive. The gallery is located at 70 Herbert Ave., Closter, NJ 07624. For additional information on any item in the auction, call 201-768-1140 or e-mail info@antiquenj.com. Visit Sterling Associates online at www.antiquenj.com. 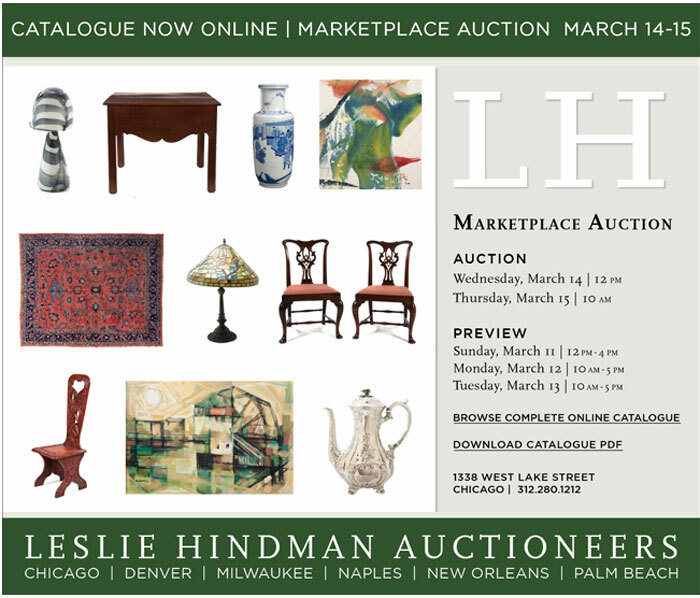 View the fully illustrated catalog online at www.LiveAuctioneers.com.